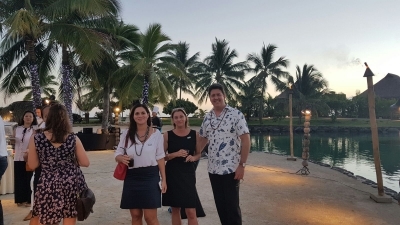 In cooperation with Air Tahiti Nui, Tahiti Tourisme invited 8 tour operators to The Islands of Tahiti. During our stay we experienced the islands of Tahiti, Moorea, Raiatea, Bora Bora and Rangiroa. During the 8 days we had a perfect combination of site inspections and excursions. We get to know the different types of accommodation, the uniqueness of the destination and its islands lifestyle. With a group of 10 ladies we take a lot of pictures, below a few impressions. In September I had the pleasure to travel to the beautifull "Islands of Tahiti". I was truely intrigued by the beauty of the islands and embraced by the Mana. Thanks to the amazing team and see you next year.